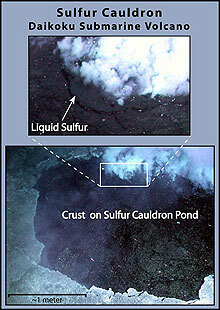 At Daikoku volcano, researchers came upon a convecting, black pool of liquid sulfur with a solidified sulfur crust. Gases, smoke, and liquid sulfur bubbled up from the back edge of the sulfur pond. Click image for larger view, more information and image credit. The science party was incredulous — and a bit giddy — when they first realized that liquid sulfur was bubbling up from this pit (later named Sulfur cauldron) at Daikoku volcano. Click image for video, more information and image credit. One of the most exciting 20th century discoveries was the active sulfur volcanism on Io, the innermost major moon of Jupiter. Last night, we came across another extreme of sulfur volcanism in the solar system, a convecting pool of liquid sulfur under more than 40 atmospheres of pressure! At first it was rather difficult to see the pool's surface, because the sulfur was black! However, as we stared through the remotely operated vehicle (ROV) Jason's eyes into the pit, a roiling dark surface of partially solidified crust came into focus. This was a rather precarious place for the Jason ROV, but the long experience and confidence of the Jason team once again came through for us. A sulfur sample was obtained by dropping the anchor chain of one of our markers into the lake. The temperature (187°C, or 369°F) was measured by gently nudging Jason to the very edge of the pit and slowly lowering the temperature probe into the sulfur. 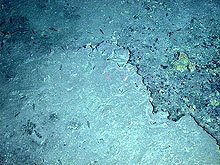 The "Cauldron," as it has come to be known, provides us with one small window into the subsurface "plumbing" of this underwater volcano. 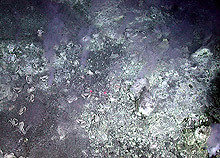 Are there large pools of molten sulfur beneath the summit of Daikoku? 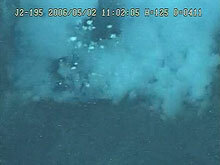 Do the gases released by the sulfur (primarily hydrogen sulfide) feed the pervasive vent community on the sea floor? 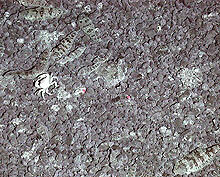 Tongue fish and crabs are part of the extensive vent community on the sea floor at Daikoku. The fish blend in well on this pebbly substrate, but it is easy to spot the larger fish (in the bottom right corner). The lasers — two red dots in the center of the image — are 10 cm (4 in) apart. Click image for larger view and image credit. 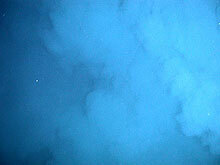 White smoke seeps from the sea floor near the "Cauldron" sulfur pond. Small white crabs flourish in the area. The image is of an area about 2 m (6.5 ft) across. Click image for larger view and image credit. The presence of extensive sulfur crusts in the vicinity of the cauldron implies past eruptions of sulfur. So, as in the case of the NW Rota-1 volcanic eruption, we are probably "seeing" only one phase of its activity! The presence of extensive sulfur crusts in the vicinity of the cauldron implies past eruptions of sulfur. Click image for larger view and image credit. One of the craters at the summit of Daikoku is over 100 m (more than 325 ft) deep and about 80 m (260 ft) in diameter. A large plume of white fluid slowly rises out of it. Is there a larger pool of molten sulfur at the bottom of this pit? Click image for larger view and image credit. 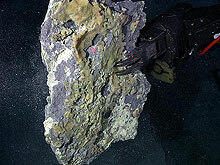 The Jason ROV holds up a large piece of sulfur crust that was sampled at Daikoku. Click image for larger view and image credit. We also have mapped two large craters on the summit of Daikoku. One of these pits is over 100 m (more than 325 ft) deep and about 80 m (260 ft) in diameter. A large plume of white fluid slowly rises out of it. Is there a larger pool of molten sulfur at the base? Although we'd very much like to know what lies at the bottom, it doesn't seem to be a very healthy place for Jason to descend into! Anyway, as is usual in science, a new discovery almost always raises more questions than it answers.